Children will take this book of words and pictures to their hearts. What would you say about eye-brows? Miss Krauss and the many children who made suggestions, re-visions, additions (and subtractions) to this book say, "Eyebrows are to go over eyes." Children will take this book of words and pictures to their hearts. Of course, a brother is to help you, a package is to look inside, arms are to hug with, and a book is to look at. 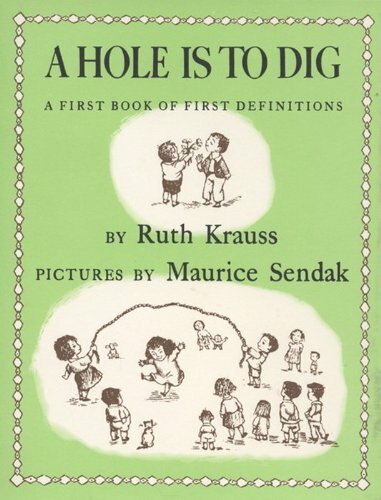 Ruth Krauss (1901-1993) is the author of over thirty books for children, including the classics The Carrot Seed and A Hole Is to Dig, illustrated by Maurice Sendak. “Ruth Krauss’s intuitive ability as a writer to capture the free-spirited thought processes and laughter of young children ensures her books’ widespread acceptance and timeless appeal.” So concludes her entry in children’s Books and Their Creators (1995). Winner of the 1964 Caldecott Medal for Where the Wild Things Are, in 1970 Sendak became the first American illustrator to receive the international Hans Christian Andersen Award, given in recognition of his entire body of work. In 1983, he received the Laura Ingalls Wilder Award from the American Library Association, also given for his entire body of work. Maurice Sendak was born in Brooklyn in 1928. He now lives in Connecticut. Learn more about him here.